One of my favorite things about living in Southern California and being so close to the largest “Little Saigon” Vietnamese-American community is the ability to go big during Tet, or Lunar New Year, celebrations, the most important holiday in Vietnamese culture. 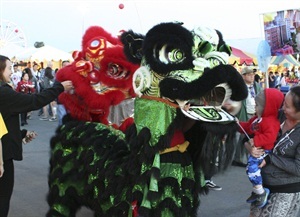 There were three celebrations this weekend — the Little Saigon Tet Parade in Westminster, Calif., the OC Tet Festival (Hội Tết Cộng Đồng) at Mile Square Park in Fountain Valley, Calif., and UVSA’s Tet Festival (Hội Tết Sinh Viên) held at the OC Fairgrounds in Costa Mesa, Calif. The nail community did not disappoint, with plenty of representation at all three events. Here’s a look at all things nails at these events. On Saturday, Feb. 13th, the Little Saigon Tet Parade drew crowds of up to 20,000 spectators along a mile stretch of Bolsa Ave. between Newland Ave. and Bushard Ave., which is considered the heart of Little Saigon. 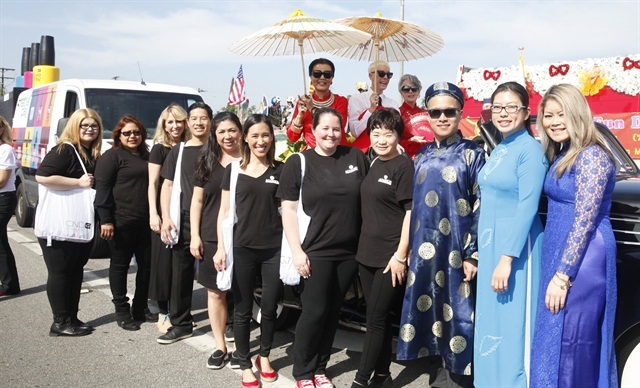 The parade brings out the entire Vietnamese-American community and features the diverse organizations and companies that make up the community. 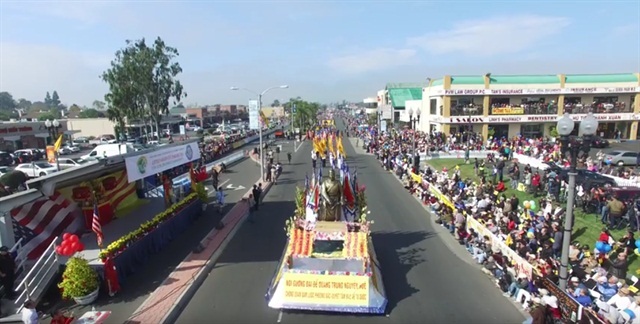 This video, which aired on Little Saigon TV, shows the four-hour-long parade in its entirety, starting at the 55-minute mark. 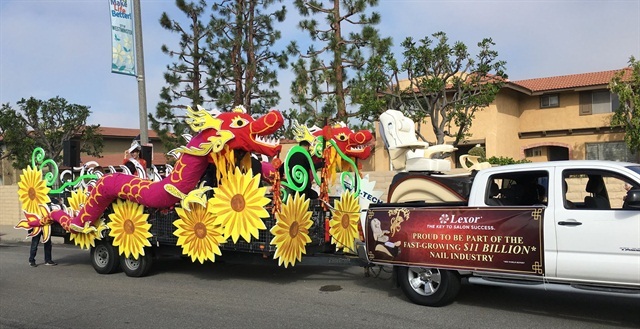 Lexor, Inc. had a fantastic float in the Tet Parade showcasing two dragons and Lexor’s Elite pedicure spa chair. 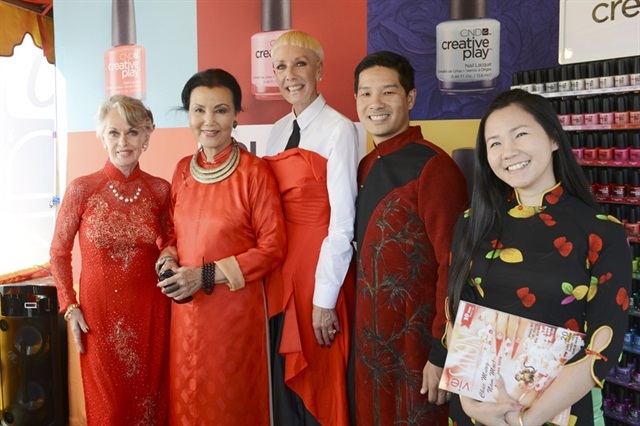 CND has its first float in the Tet Parade with CND's co-founder and style director Jan Arnold in a classic Lincoln Zephyr flanked by Vietnamese actress Kieu Chinh and actress and humanitarian Tippi Hedren, who is also credited with helping start the Vietnamese nail industry. During the parade they were accompanied by CND education ambassadors, Toronto-based John Nguyen and San Diego-based Michele Huynh. Alongside CND’s video float, students and staff of Advance Beauty College based in Garden Grove, Calif., handed out thousands of mini bottles of CND’s newest product set to officially launch on March 1st. 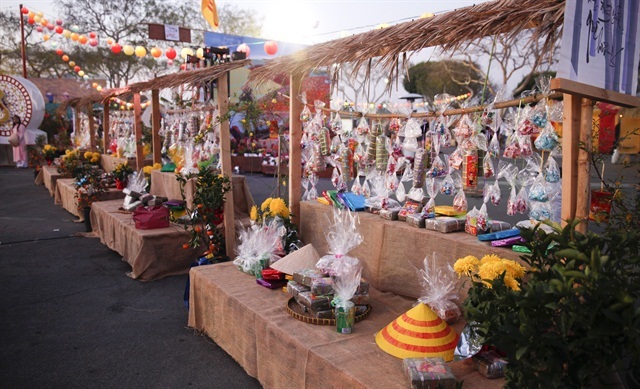 The Tet Festival, hosted by the Union of Vietnamese Student Associations in Southern California, took place Feb. 12-14 and is the longest running and largest Tet Festival (specifically Vietnamese Lunar New Year festival) in the world, celebrating culture with a cultural village (seen above), the Miss Vietnam of Southern California (also known as Hoa Khôi Liên Trường) cultural pageant, a mock Vietnamese wedding procession, a pho-eating contest, and entertainment on two stages. 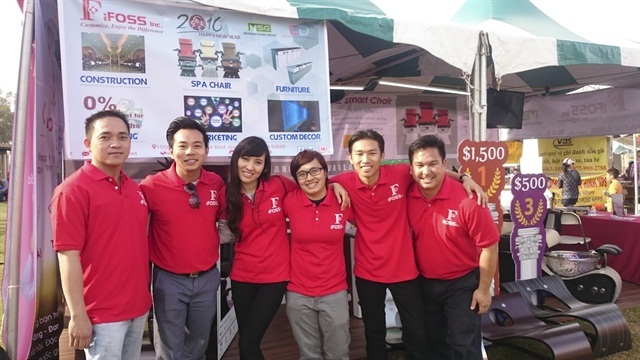 To help celebrate VietSALON Magazine’s 10th year anniversary, we wanted to support the local community with our own booth at the Tet Festival. 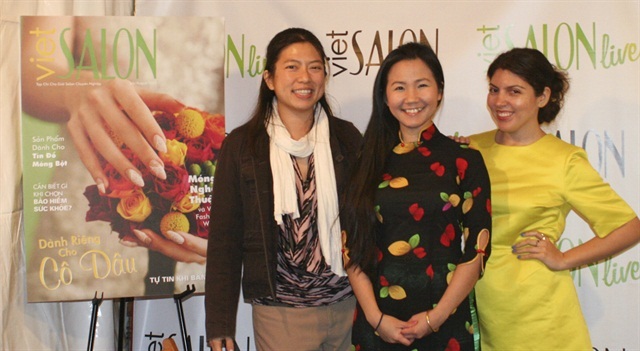 We showcased Lunar New Year nail art murals by talented Vietnamese nail artists, gave away nail goodie bags to attendees, and promoted our newly designed website, www.viet-salon.com (with more content coming soon!). 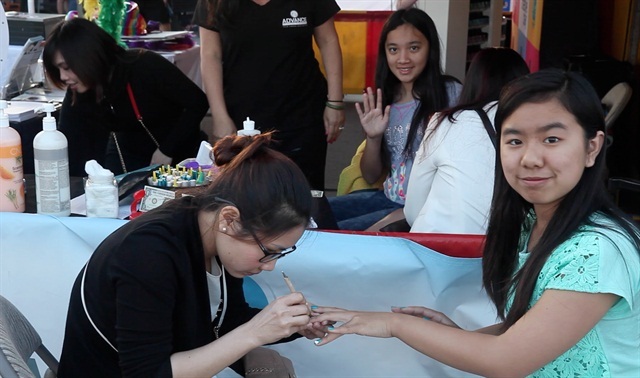 CND also debuted at the Tet Festival with nail polish giveaways and a Creative Play station where attendees could test out any of CND’s 80 colors. Jan Arnold, alongside Tippi Hedren and Kieu Chinh, made an appearance. On Saturday, attendees took Smilebooth photos that were turned into animated gifs. VietSALON’s Anh Tran and I took this one with CND’s Michele Huynh and John Nguyen. 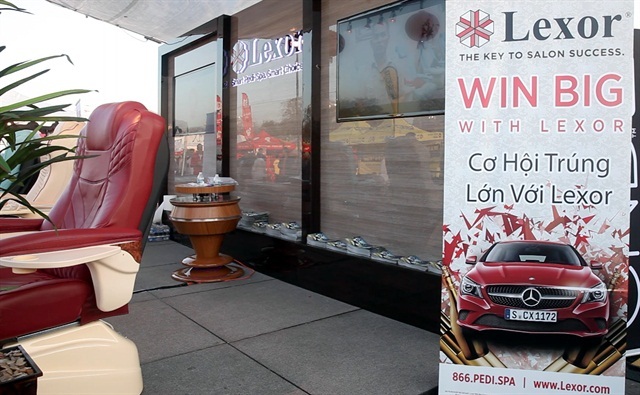 Lexor promoted a sweepstakes that runs throughout 2016, where you could win a Mercedes. Advance Beauty College gave away free haircuts, manicures, and massage certificates to those who stopped by their booth. The student were even on hand for manicures and massages. 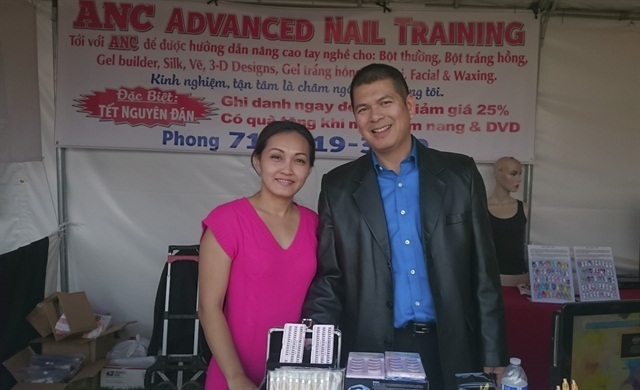 VietSALON’s Anh Tran stopped by the OC Tet Festival held by the Vietnamese Community of Southern California (VNCSC). The three-day event took place Feb. 12-14 at Mile Square Regional Park in Fountain Valley, Calif., and offered free admission, a Miss OC Tet pageant, and entertainment throughout the festivities. Starting the day, Tran caught a glimpse of Qlashes booth during setup. The iFoss team — Hoang Duong, Tjay Phu Nguyen, Kimtran Huynh, Yvonne Huynh, Man Trinh and Chris Okaniwa — offered a game to win a iFoss gift certificate worth $500 to $1500. ANC Advanced Nail Training's Tuyetnga Huynh and Phong Ho introduced classes on acrylics, 3-D sculptures, and nail art designs. 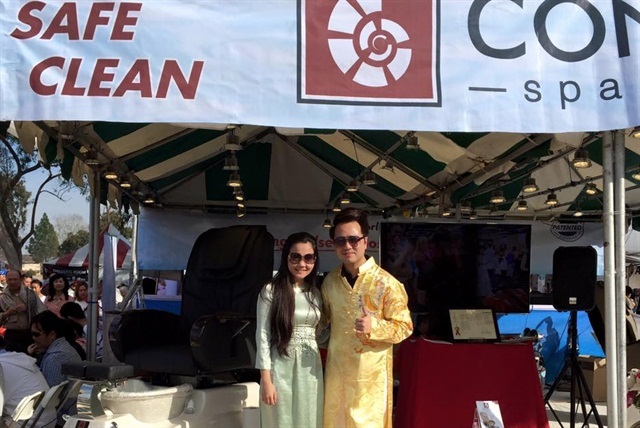 Both VietSALON’s Anh Tran and Contégo Spa Designs’ Brandon Thanh Phuc wore bright and colorful aó dài, traditional Vietnamese attire, at the OC Tet Festival. LôngMi Lashes by Daniel Phu was crowded throughout the day with five eyelash extension demo stations.